If you want to light up signs and advertisement billboards, Greeshine's solar signage lighting solution is optimal! Most of the time, this kind of signs and billboards are installed in elevated locations or in the street with lack of direct grid electricity available.Greenshine signage lighting solution is perfect for a wide range of lighting applications such as monuments, statues, entrance signs, entrance or large advertisement billboards. 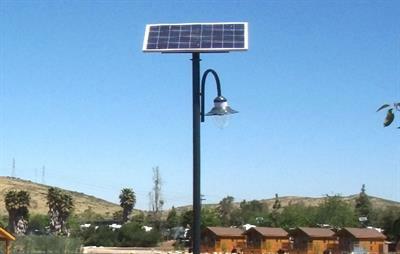 Easy to install our solar sign lights do not require regular maintenance. Saving energy No wire voltage, trenching or metering. No electrical bill. No CO2 emission. No fuels comsuption. By Shandong Kaich Optical & Electronic Technology Co. based in CHINA. SolarOne and its local partner first worked closely with Masdar personnel and their contractors to develop a lighting plan that would illuminate the incoming roadway and parking areas around the site offices. Using SolarOne’s LOS (Shoebox Series) fixture for the parking lots and roadways the designated areas are illuminated to an average of over 6 lux during peak hours. SolarOne was tapped again to provide the solution for lighting the Atkins ring road that encircles much of the 6.3 sq. kM city. By SolarOne Solutions, Inc. based in Needham, MASSACHUSETTS (USA). 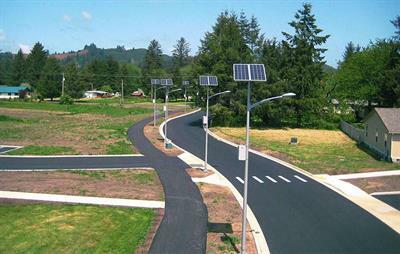 Parking lot lights powered with solar energy is an efficient way to drastically decrease electricity bills! Greenshine provides an efficient solution for all types of parking lots that meet the standard lighting requirements for parking lots. Parking lots are required to meet some standards in term of lighting level as brightness is a priority concern for security reasons. As the world addresses the challenges of global warming green energy production and in particular wind energy generation has increased significantly. Biral can provide sensors for the control of aviation obstacle light intensity, wind speed measurement and site assessment. The Deutscher Wetterdienst (German Meteorological Service – DWD) has certified the VPF-710, SWS-100 and SWS-200 sensors as suitable for use in visibility controlled wind turbine obstruction light systems. By Bristol Industrial & Research Associates Ltd (BIRAL) based in Portishead, UNITED KINGDOM. STEKLONiT offers solutions for wind energy, one of the most promising sectors of electric-power industry. Thanks to inherent high quality, physical-mechanical properties, light weight, STEKLONiT’s glass fabrics are used in manufacture blades and tubes of wind power generators. Products can be manufactured according to a customer`s requirements and delivered to any place in the world. By Steklonit JSC based in Moscow, RUSSIA.